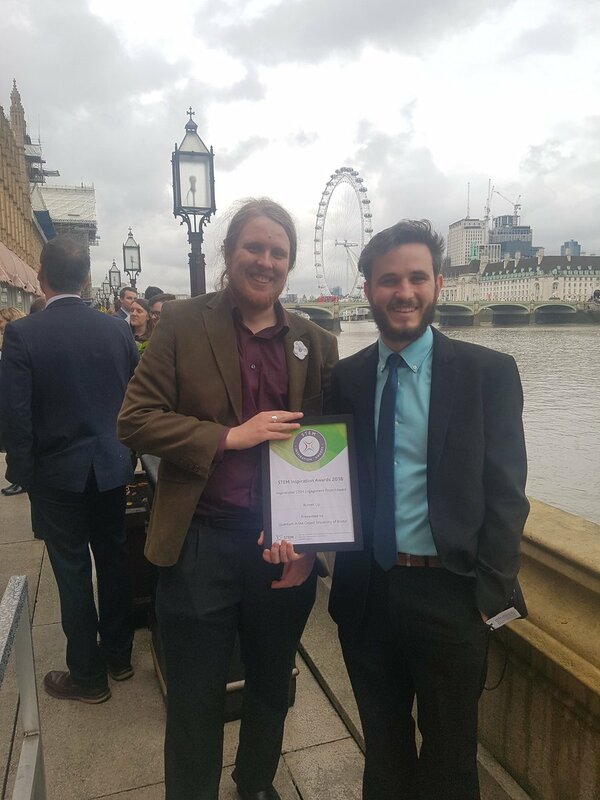 Earlier this month, QECDT students Alasdair Price and Henry Sememenko were invited to the House of Lords, where they were presented with the Runner Up prize for “Inspirational STEM Engagement Project” at the prestigious STEM Inspiration Awards. The project, “Quantum in the Crowd”, was launched by the QECDT’s first cohort in 2014 and aims to educate people across the country from a diverse range of backgrounds by encouraging researchers to exchange lasers and laboratories for participation with the public. Since 2014, the project is estimated to have engaged with over 50,000 people at 45 events such as the Cheltenham and Manchester Science Festivals and the Royal Society Summer Science Exhibition, as well as collaborating with institutions such as the Royal College of Art, the V&A museum and Bristol Zoo. The Annual Summer School which takes place each year boasts excellent gender parity among its attendees, with the majority stating an increased desire to study Physics at the end of it. Congratulations to all QECDT students who have been involved in this project and who have helped to create a long-lasting and impactful outreach initiative.